You really need to start training the dressage horse in an arena measuring 20 by 40 metres. This is the standard size of a dressage arena but if you can’t mark out your own arena, consider hiring a manege at a local riding school or a stable or livery yard. 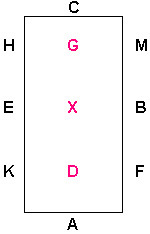 If building your own dressage arena, the markers A K E H C M B F can be bought reasonably cheaply on ebay or from local tack shops ready made on spikes. Or you can make your own dressage markers by painting them on boards, or buckets or water barrels. Just make sure to always weigh these down with water or sand, as they do tend to blow away. Hiring a local arena or manege should only cost around £5 to £10 an hour and is well worth the cost once a week or so. If your own livery or stable yard has a school, then this should not be a problem. Most riders begin training the dressage horse by entering unaffiliated dressage competitions. Your local riding club may run unaffiliated dressage competitions, or know somewhere that does. Check the equestrian press, which is full of local competitions or you can regularly check our equestrian events diary for your local area. 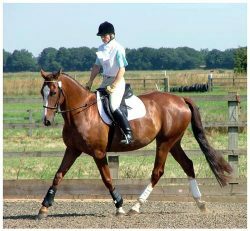 You can then try dressage at a minimum cost and make sure both you and your horse enjoy it. Eventually, if you do enjoy dressage riding, you may want to affiliate. This means joining your affiliated organisation, such as British Dressage or USDF, then entering affiliated competitions and earning points for your horse and progressing through the standards and competing at higher levels. Having decided you want to try dressage riding, what sort of dressage tack and equipment will you need? Your dressage association or federation should be able to send you a free booklet about what they do and also provide a few tips on starting your dressage competition career and training the dressage horse. NOTE: Many unaffiliated organisers have their own rules for dressage competitions, but if you follow the basic rules of your Dressage Association, you won’t go far wrong.